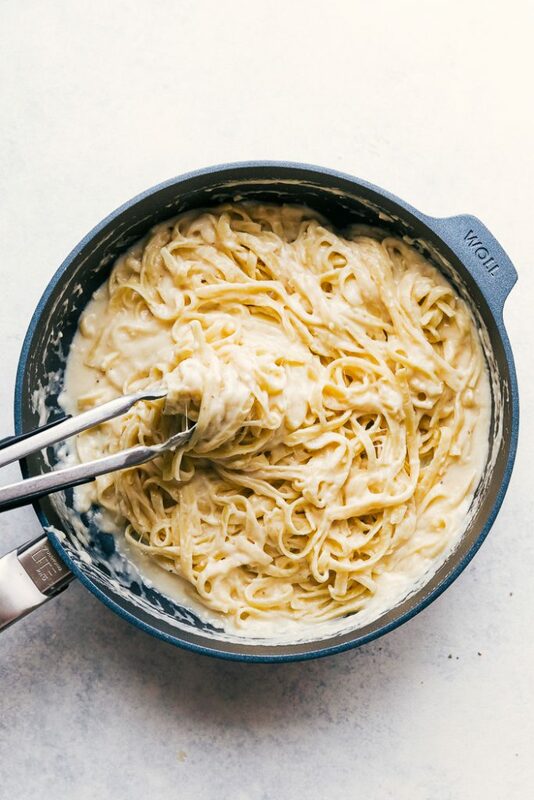 This recipe for Skinny Alfredo Sauce is insanely delicious, creamy & lightened up. You’ll love how flavorful this sauce is with fewer calories. New Year’s resolutions are a thing, but you can make your favorite dishes with a few substitutions and still have mouthwatering results. 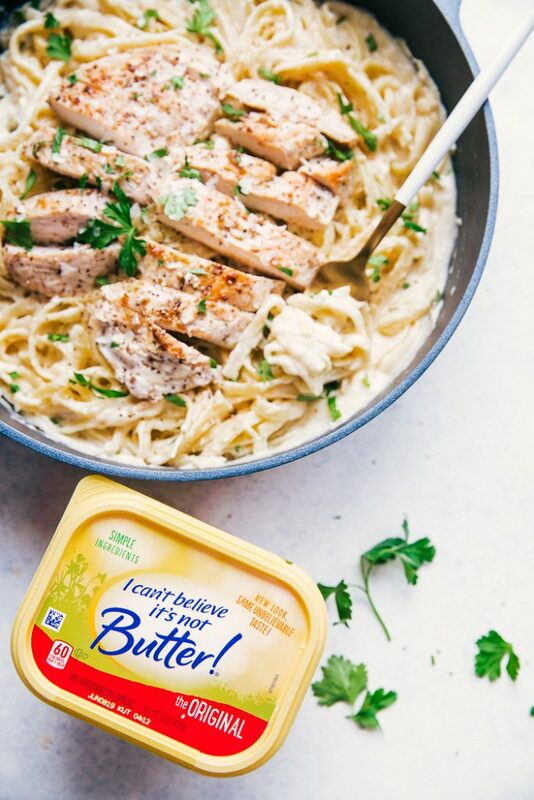 I used this Skinny Alfredo Sauce to make Chicken Fettuccine Alfredo lighter and healthier, using I Can’t Believe It’s Not Butter!, chicken broth and milk. Forget the butter and heavy cream friends; you don’t need them to make fantastic alfredo sauce. Every home has a recipe that is their to-go-to meal. For our family, it’s alfredo sauce with fettuccine. Jojo, our daughter, makes the best ever alfredo sauce – she is the pasta sauce queen. Her recipe, of course, includes heavy cream or half-and-half plus lots of butter. This new year, my son Aiden has decided to be a healthier, better version of himself. He has inspired both my husband and me to do the same. Now, this doesn’t mean that we can’t enjoy some of our favorites or that we can’t make our to-go-to meal. We can just make simple changes to make them better for us. So we took Jojo’s alfredo recipe and made a few adjustments. We removed the butter and replaced it with I Can’t Believe It’s Not Butter! and then, of course, took out the heavy cream and replaced that with chicken broth and low-fat milk. The best part is this dish tastes amazing! Aiden has decided no to do pasta anymore, but with some grilled or seared chicken, he tops it with some sauce, and he is all set with a mouthwatering meal. I still go for the pasta but just reduce the amount of noodles, and I don’t load on the extra cheese as a garnish. I remember the first time I had I Can’t Believe It’s Not Butter! It was at my grandparent’s house. My grandma always made the best buttered toast. Then I found out she didn’t use butter. Instead, she used I Can’t Believe It’s Not Butter!, and the label is true to it’s messaging. 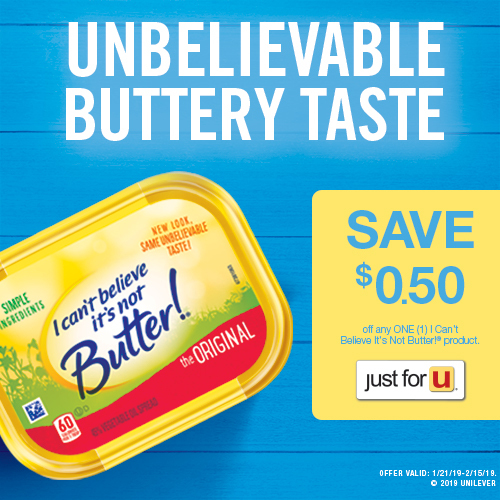 An unbelievable taste and made with 70% less fat than butter, it’s only 60 calories per serving (original)! So making that simple substitute in really any recipe, but especially this Skinny Alfredo, takes out some of those un-needed calories. Simple ingredients, no artificial preservatives, no artificial preservatives, no artificial flavors, no partially hydrogenated oils, gluten free, cholesterol free, 0g trans-fat per serving, made with vegetable oils that contain good fats and a good source of Omega 3 ALA, you are getting a healthier source of a buttery like spread. Shopping at my local Safeway, I love picking up my weekly needs and wants in one place. While I Can’t Believe It’s Not Butter! 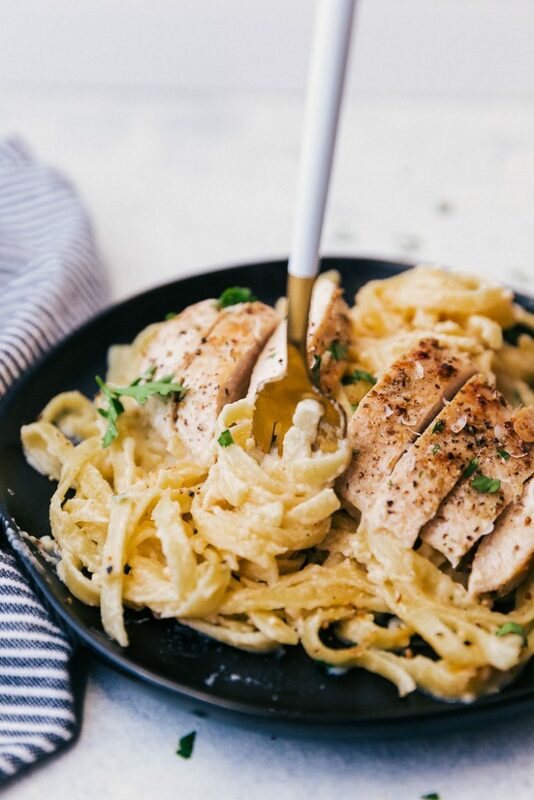 is a great substitute in recipes like this Chicken Fettuccine Alfredo, you can use it just like my grandma did in your everyday life like with toast, sandwiches, baked potatoes and mac & cheese (yum). 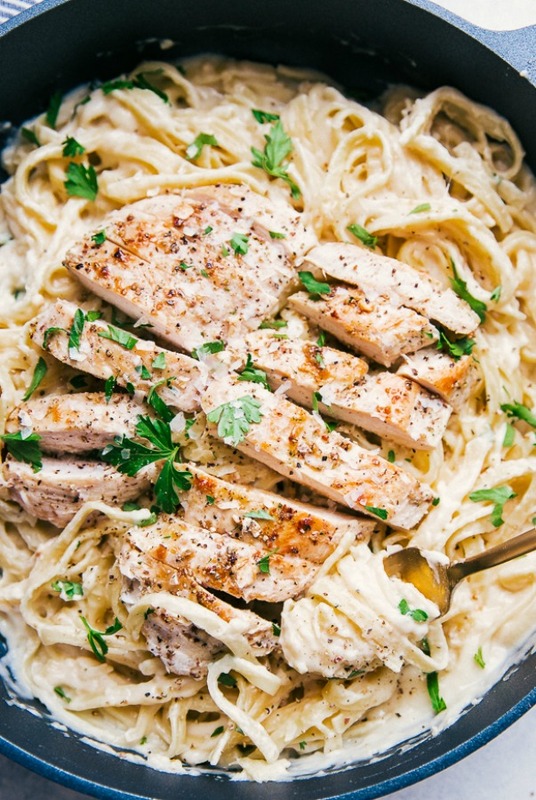 Making Skinny Alfredo is simple and easy. You are sure to love this lighter version of the original. 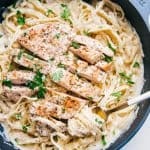 How do you make Skinny Alfredo Sauce? Over medium-high heat, melt 1/4 cup of I Can’t Believe It’s Not Butter! in a large saute pan. Add garlic and cook for one minute, stirring so that it doesn’t burn in the pan. Add flour and stir to combine, so that you have a nice base for your sauce. Cook for one minute, stirring occasionally and allow the flour to thicken. Slowly whisk in chicken broth and milk until it’s combined and is smoother, allowing the mixture to simmer for 1-2 minutes or until thickened up a bit. Whisk in Parmesan & Romano cheese, salt and pepper until all of the cheese has melted and the sauce is well combined. Reduce heat to medium-low until pasta is cooked (if you are making pasta). After cooking, drain the pasta and immediately add pasta to the saute pan with alfredo sauce and toss to combine. Alternate options to serve instead of pasta. Or you could do what my husband does and drink it straight from the pan. Friends, I am excited for you to try this recipe for Skinny Alfredo Sauce. Simple changes like swapping out butter and heavy cream can lead to a better you and a healthier lifestyle. Don’t forget to pin this recipe for Skinny Alfredo Sauce to your favorite Pinterest board for later. This recipe for Skinny Alfredo Sauce is insanely delicious, creamy & lightened up. You will love how flavorful this sauce is with fewer calories. Season chicken breast with salt, pepper, granulated garlic, and olive oil. Grill or cook in a heavy bottom pan over medium-high heat until cooked through. Meanwhile, heat I Can't Believe It's Not Butter in a large saute pan over medium-high heat. Add garlic and cooking for one minute, stirring so that it doesn't burn in the pan. Add flour and stir to combine, so that you have a nice base for your sauce. Cook for one-minute stirring occasionally allowing the flour to thicken. Slowly whisk in chicken broth and milk until it combined and is smoother, allows the mixture to simmer for 1-2 minutes or until thickened up a bit. Whisk in Parmesan & Romano cheese, salt, and pepper until all of the cheese has melted and the sauce is well combined. Reduce heat to medium-low until pasta is cooked. Drain pasta, then immediately add pasta to the saute pan with alfredo sauce and toss to combine. Topped with grilled chicken and garnish with dried or freshly chopped parsley and cheese. Who doesn’t love saving with an easy click of a coupon? Make sure to use this I Can’t Believe It’s Not Butter! coupon between 1/22/2019 – 2/15/2019! Nothing beats a good skinny dish! This dish looks amazing, I am going to have to add it to my list of must make dishes. It’s a delicious healthy dish for sure! Hope you enjoy. We love pasta here too! I hope you enjoy, thanks! This is a tasty recipe. 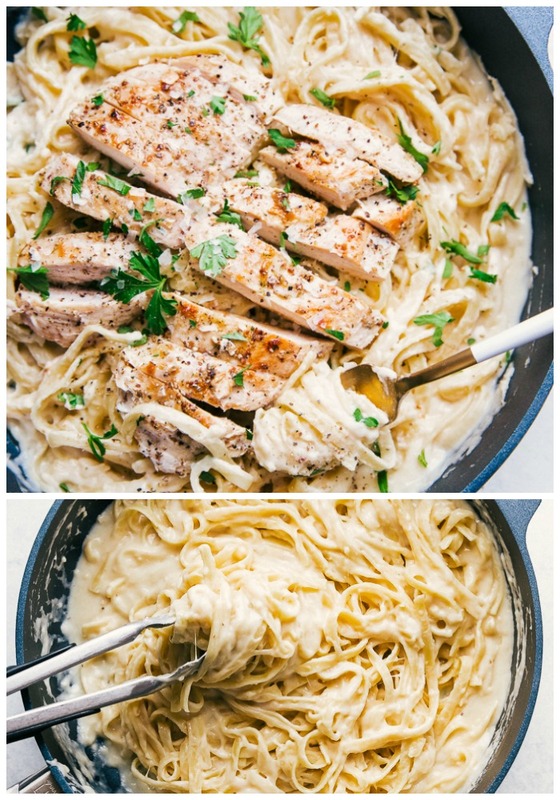 I’ve tried other alfredo recipes and this is the only one I’ve liked. My picky family (husband) like it too! Followed recipe exactly as listed and it turned out great. It’s always great to find something that picky eaters like, I’m so glad they enjoyed it! Thank you! It’s always nice to find new recipes that the whole family likes. Thank you, enjoy! This is such a mouthwatering recipe! Pasta is always a favorite in our house! It’s a favorite here too! Hope you enjoy. This looks so creamy and delicious! I love that it’s lightened up, too! Yum! I hope you enjoy, thanks! So delcious! And of course I like it because it’s lighter. This is such a perfect weeknight meal! It’s definitely great for busy weeknights here. Thanks! Comfort food dinner for the win! Love how you lightened this up! I like your technique to lighten this up! I haven’t ever tried the butter, but I just wrote it on my grocery list! It’s definitely a great, light substitute. Enjoy! We have 5 feet of snow on the ground, more is coming this weekend, and we have family coming in a few weeks. I have lot of occasions to make this dish, I’m thinking!! Comfort love. The few inches we got here in CO yesterday feels like nothing compared to that! I hope you enjoy the meal, and stay warm! I need to give this a try! Looks so delish! This looks so creamy so good! Thank you for sharing the sauce recipe. I can’t wait to try it! Thank you, I hope you enjoy it! Let us know how it turns out.